Clutch Pedal Vibration - What Does it Mean? If you’ve noticed clutch pedal vibration - either when you've got the pedal fully disengaged, when you're launching, or a constant vibration - these are the most common clutch issues that can cause this problem. Misalignment in the clutch happens when the assembly is not accurately aligned with the vehicle’s flywheel. This will cause the clutch to engage inconsistently, putting an unbalanced load on the surfaces of the clutch and flywheel. It’s not uncommon for the result to be chattering, pulsating, and vibration coming from the clutch pedal. The amount of pressure applied to the pressure plate and clutch disc is controlled by a diaphragm spring that seats these against the flywheel. Should the diaphragm spring become damaged or broken, this will cause the clutch plate to engage unevenly with the flywheel when applied or released — the result is vibrations and pulsations in the clutch pedal. It’s the clutch disc that actually connects the engine flywheel to the driveshaft/axle when the clutch is engaged. It is constructed of materials similar to brake pads and operates on the same principals of friction. To work properly, the contact surfaces must be smooth and flat. If the clutch disc becomes warped due to wear or overheating, it won’t engage smoothly. The result of a lack of smooth engagement with the flywheel and pressure plate is chattering, vibration, and pulsation in the pedal. The throw-out bearing is an essential part of the assembly that engages and disengages the clutch. When you compress the clutch pedal, the throw-out bearing will move forward to push on the pressure plate fingers — this then releases the spring pressure and pushes the pressure plate against the disc. If this part is installed improperly, the contact with the pressure plate fingers will be uneven. This will result in uneven clutch disc contact, which often results in vibrations. 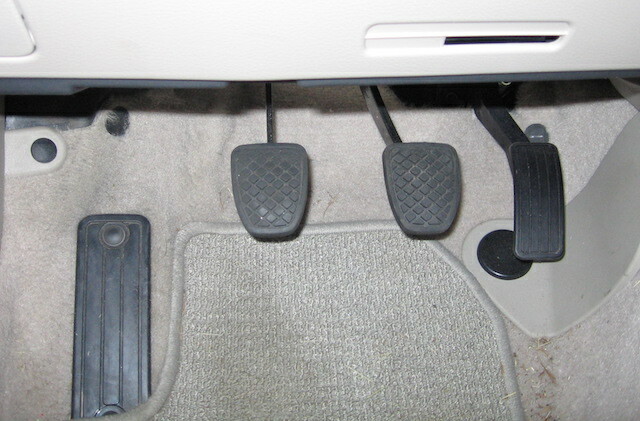 These are the most common causes of vibrations in your clutch pedal coming from the clutch/transmission. If you have issues beyond these problems, give us a call so we can help you troubleshoot your clutch pedal woes.